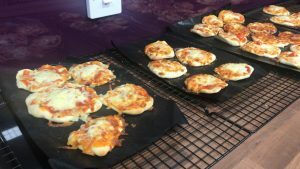 The cooking club is run by Mrs Smith and Miss Cooke on a weekly basis. Previously, we have entered Bradford’s Market Challenge, where we have competed against other schools in the district. Over the four years, we have come away with 2 awards for best product and outstanding team award. We are very proud of our achievements and our products. 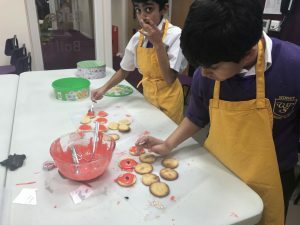 This year cooking club will start after October half term for year 5. Children’s names are chosen out of a hat. The groups are rotated each half term to enable everyone to attend throughout the year. Each year we run a stall at the Christmas Fair, this helps us raise money so that we can keep the club running by offering a reduced cost to the children of just £1 a week – not bad for all the goodies they make and take home. We will update the page when the club starts and show off our baking skills! See below for our recipes. Spaghetti and cheese nest with homemade meatballs. 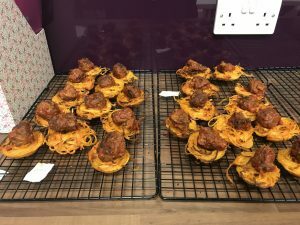 This week, Cooking club made spaghetti and cheese nests and homemade meatballs. They were delicious and well worth the effort. Although squidging all the meat, breadcrumbs, cheese and egg together with our fingers was a very strange feeling! Have a look at how great they are. 1. Combine flour, salt, sugar, and yeast in a large bowl. 2. Mix in oil and warm water. 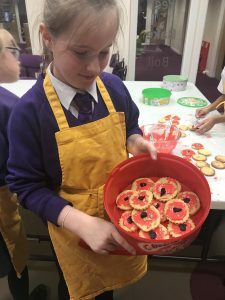 To honour the fallen, Cooking club made Shortbread Poppies. mix the flour and sugar together and rub in the butter. roll out and cut into poppies. decorate with icing to look like Remembrance Poppies.